Turmeric is a plant used to make the popular Indian spice curry. According to Medline Plus, the turmeric root is commonly used for medicinal purposes. While turmeric usually is safe to use, you should consult your doctor before taking turmeric supplements because it can cause side effects and interact with other medications, especially blood thinners. Turmeric is useful for treating upset stomach and is a common treatment for bloating, indigestions, diarrhea, gallbladder problems and heartburn. The active substance in turmeric is called curcumin and is used to stimulate bile production in the gallbladder that eases stomach discomfort. Ayurvedic and Chinese medical practices long have relied on turmeric to treat inflammation. According to the University of Maryland Medical Center, because of its anti-inflammatory properties, turmeric may help reduce the pain of osteoarthritis. Other uses for turmeric include treating ulcers and preventing certain types of cancer and diabetes. Turmeric also is a powerful antioxidant that can help to fight the damage caused by free radicals in your body. Turmeric can lead to bleeding and slow blood clotting. 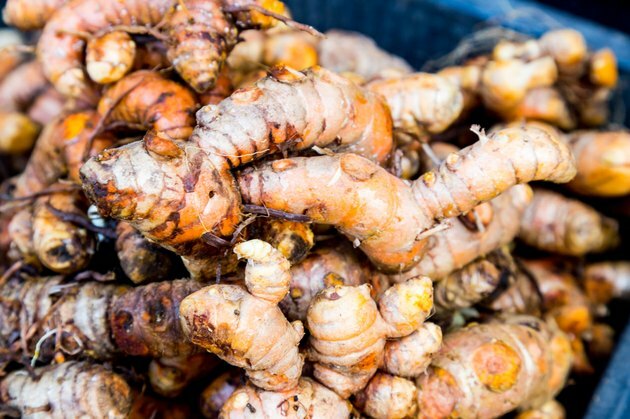 You shouldn't take any turmeric supplements for at least two weeks before undergoing surgery to allow your blood to return to its normal clotting abilities. Increased bleeding can occur if you also are taking any medications aimed at reducing clotting such as warfarin, heparin, aspirin or naproxen. Tumeric can stimulate menstrual bleeding if you're pregnant and thus should not be taken during pregnancy. While there doesn't seem to be any harmful interactions when you take turmeric with any foods, various herbs can increase your chance of excessive bleeding and bruising. There is a wide range of herbs that also slow blood clotting, so you should refrain from taking combinations of herbs when you use turmeric supplements. Herbs that also reduce clotting and can interact with turmeric include ginseng, red clover, garlic, clove and gingko. Turmeric roots are boiled and dried to form a yellowish powder. It has a bitter, warm taste that you can use in sauces and shaken over other dishes. For supplements, the powder is placed in capsules, made into tinctures or used as a fluid extract. Recommended doses vary and depend on your weight and the type of delivery system you use, according to the University of Maryland Medical Center. For example, a 150-pound adult can take about 400 to 600 mg of standardized powder three times a day or 15 to 30 drops of tincture four times a day.